Make your Christmas tree Pinterest-worthy with these simple steps. For many, the most enjoyable time of the holiday season is decorating the Christmas tree. However, if you are looking for some help this year, let us guide you through the basics of making a beautiful tree. 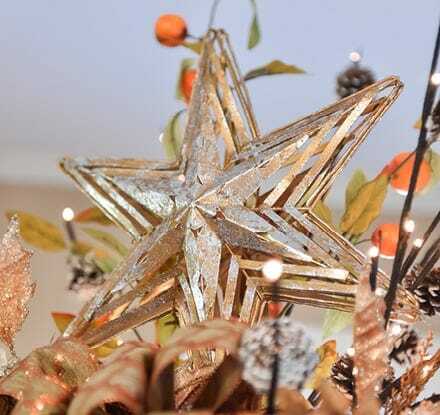 Ornaments, lights, and garland give you a good start, but there are many accessories you can add for the best visual celebration of Christmas. For example, our designers love to place table top decorations that match the trees’ theme right onto the tree branches. 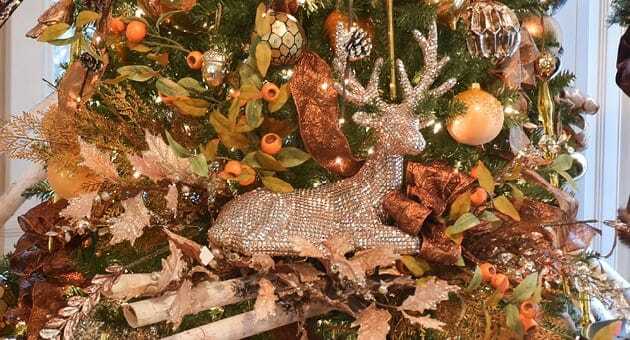 A glitter deer table top decoration is a great example of a way to incorporate this technique. Just make sure that any decorations you add are properly secured. Let your imagination run free, and don’t be afraid to experiment! Select the desired location for your Christmas tree and place it in the stand. Many artificial trees come with a tree stand included. However, if yours doesn’t come with one or you feel a different one may suit your style better, there are other options available. We carry a selection of tree stands for both artificial and live trees here at Christmas Central. Our live tree stands even come with an easy watering feature, saving you the time and hassle. If you don’t have a pre-lit Christmas tree, you'll want to test your Christmas lights first. Join the strings together and plug them in. Replace any dead bulbs and make sure the cords aren't damaged. Please see our Safety Guide for more tips on lighting. How many lights should I use? Don’t skimp out on your lights! You should use a 100-light set per Christmas tree foot. So if you have a 7-foot Christmas tree, you will want to buy seven (7) '100-light sets'. The biggest thing to remember when putting lights on a Christmas tree is how bright you want it to look. If you are using LED lights on a Christmas tree, you will want to use fewer lights as LED lights can be more intense. Don’t be afraid to mix and match lights. There is no rule that says you only have to use one kind of light, so be creative! If you are using any themed lights or novelty lights, just be sure to put them on after the basic lights and evenly space them apart. See our section on how to decorate with lights for more tips. Where do I put my Christmas lights on the tree? After you've made sure that all of your lights are working, string them on your tree starting from the top down. Weave strings of lights along the branches ’inside,’ then move to the outer edges of the branches. If you have a lit tree topper, make sure that you leave the socket end of the lights at the top of the tree to plug it in. What tree topper should I use? The tree topper symbolizes the spirit of Christmas, and is one of the most important pieces on your tree. Tree toppers come in a wide variety of styles, shapes and colors. Angels and stars are the most common tree topper shapes used in the United States, but it can be more fun to try a unique approach such as a peacock or finial. Much like other lights, our pre-lit tree toppers come in incandescent and LED options, and come in sizes ranging from less than 5 inches to well over a foot tall. How do I place my tree topper? If your tree topper is electric, make sure to plug it into the socket end of the lights that you left open at the top of your tree. Keep in mind that just because it's a tree topper does not mean it has to go right at the top of the tree. If you have a 7.5 foot ceiling and a 7.5 foot Christmas tree, you can always put it off to the side a bit. You can also consider folding down the top branch of the tree to gain a few more inches. How much garland should I use? A rule of thumb is at least nine (9) feet of garland per foot of tree, so a 7-foot Christmas tree will need sixty-three (63) feet of garland. We recommend buying more garland to be on the safe side. If you are left with any extra, you can always use it on the mantle or in wreaths. How do I place my garland? With garland, it’s best to start at the top and work your way down in a spiral pattern going around and around the tree until you get to the bottom. Gently-swagged garland looks more graceful than straight or diagonal lines across the tree. Deeply swagged garland is beautiful, but can only be used on large trees with open space between branches. You can also place your garland vertically. Just attach it to the top of your tree (behind the tree topper) then loop it down vertically. Be sure to add some twists and turns, wiring to branches if necessary, in order to add interest and graceful curves. This technique is especially suited to ribbon. You can cut beaded garland into different lengths and use it as tinsel to drape over branches. Be sure that the garland is knotted to keep the beads from falling off of the string. Strings knotted between each bead or styles where beads are glued in place will work for this technique. How many ornaments should I use? You’ve set up the basics, now comes the fun part: the ornaments! The amount of ornaments to put on a Christmas tree is not an exact number. The amount to use can vary depending on the size of the ornaments, the height and width of your tree and the ornament density that you desire. In the end, it all comes down to your style and preference. 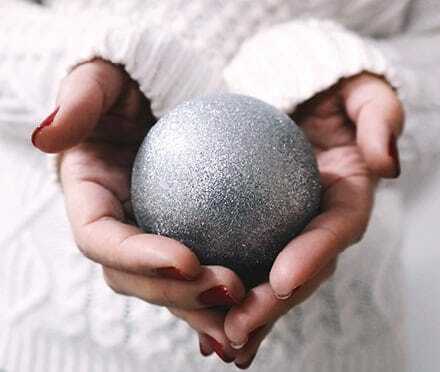 While we can’t tell you exactly how many ornaments to hang on your tree, we can provide you with a guideline to help you estimate how many ornaments you should use. For trees under 9 feet, we would recommend using 10-15 standard size ornaments per foot. If your tree is 9 feet or taller, we recommend 12-20 ornaments per foot. How should I hang my ornaments? To really make a statement with your Christmas tree, start with the most important ornaments. Next, hang the larger ones, spacing them evenly apart. You will then want to fill in the spaces with any medium and small sizes to balance the overall look of the tree. You can place ornaments and other decorations ’inside’ your tree as well as on the tips of branches to add depth and interest. If you have pets or small children, try placing shatterproof ornaments near the bottom or in high-traffic areas. There are a couple things to note. Make sure to purchase your ornaments based on your tree size. Larger ornaments may take up too much space on smaller trees, while smaller ornaments may not even be visible on larger trees. Additionally, we also recommend that you have extra ornaments on hand in case any of your ornaments are lost or broken. 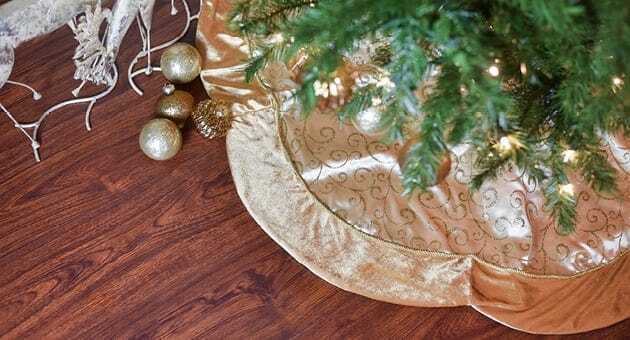 Tree skirts are not included with most trees but are a very popular accessory. Not only do they hide the base of the tree, but they can also add some character to your setting. 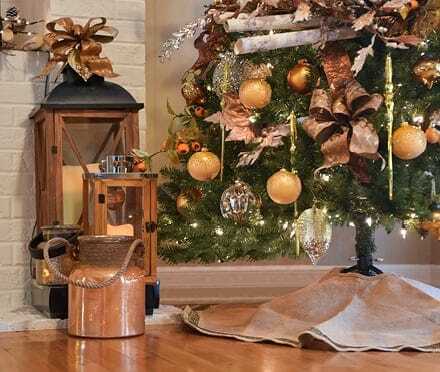 Much like stockings and ornaments, tree skirts come in a wide array of styles, from solid, colored velvet to patterns to little scenes involving carolers or snowmen. Make sure your skirt is wide enough to cover the tree stand, but does not extend past the bottom branches of the tree. Consider the size requirements, color scheme, and the theme your tree may have. Once your tree is completely decorated, go ahead and add some presents under your tree. If you haven’t started shopping yet, that’s okay! Our designers often wrap empty boxes, or add other large scale decorations such as lanterns, Santa Claus figures or nutcrackers. For decorating oversize or commercial Christmas trees, you can follow the same format as decorating other trees. 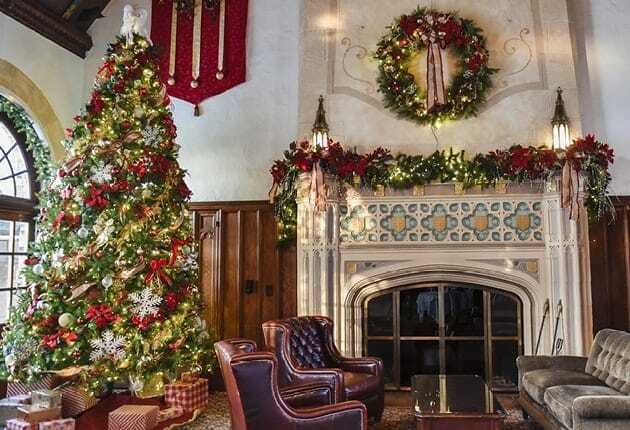 However, if all that tree space feels overwhelming, here are a few extra tips to guide you through the decorating process. First, mentally divide your tree into four sections, picturing your tree as if it were a giant box with four sides. Next, divide your collection of ornaments into 4 even groups. 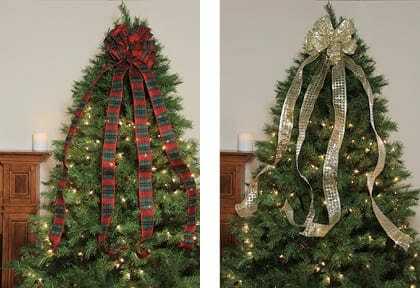 Apply ornaments to each tree section starting from the small ornaments and moving up to the largest size. A 12’ Christmas tree can be heavily decorated with ornaments. A good suggestion is forty (40) ornaments per foot, or a total of four-hundred-and- eighty (480) ornaments. For a more uniform look, evenly space your ornaments based on their characteristics: color, shape, style, etc. As trees get taller, they also get wider and have more space to fill. With larger Christmas trees, you should generally have nine (9) feet of garland per foot in tree height. It is a good idea to have extra garland to fill up space if needed. Ribbons are a good way to easily fill up empty space on a tree. These are often utilized in sprays and other arrangements; there is no limit to what can be done! The above tips are simply suggestions to help get you started on a classically-decorated Christmas tree. If you are feeling extra creative, feel free to play around with different techniques and styles to see what looks right to you!